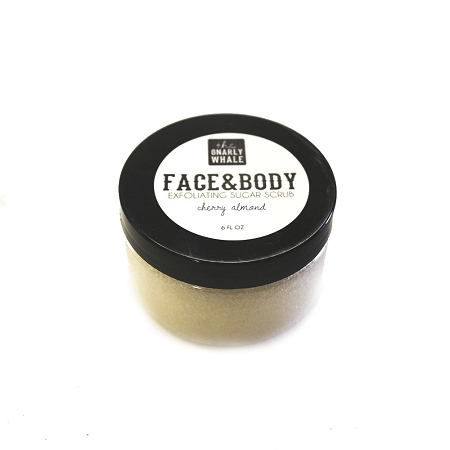 Give your skin some much-deserved TLC with our simple yet powerful Face and Body Scrub. Our exfoliating sugar scrubs are the perfect solutions for smoothing out rough or dry skin, especially during the winter months. They are gritty enough to aid in clearing pores and help shed dead skin, but soft enough to not aggravate sensitive skin. We do not use any dyes in our sugar scrubs. Use on both your face and body to exfoliate your skin. Start with a small amount and massage onto your skin then rinse thoroughly. Work greats to remove dirt and grime from your hands as well! Description: A classic combination of freshly picked cherries and sweet almond.